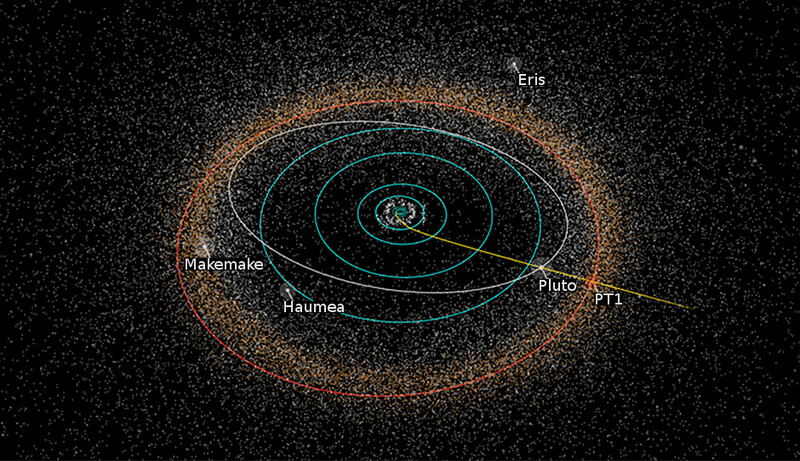 After having completed its successful encounter with Pluto and its moons last July, the New Horizons spacecraft is now setting its sights on its next target much farther out in the Kuiper Belt: a tiny rocky world called 2014 MU69, which is less than 30 miles in diameter and orbits nearly 1 billion miles past Pluto, in the far outer reaches of the Solar System. According to a report last week by the Associated Press, New Horizons fired its thrusters for the first in a series of course-correction changes this afternoon. Four such maneuvers will be needed altogether over the next two weeks. Flight controllers at the Johns Hopkins University Applied Physics Laboratory in Laurel, Md., sent commands to the spacecraft in advance for the course change. 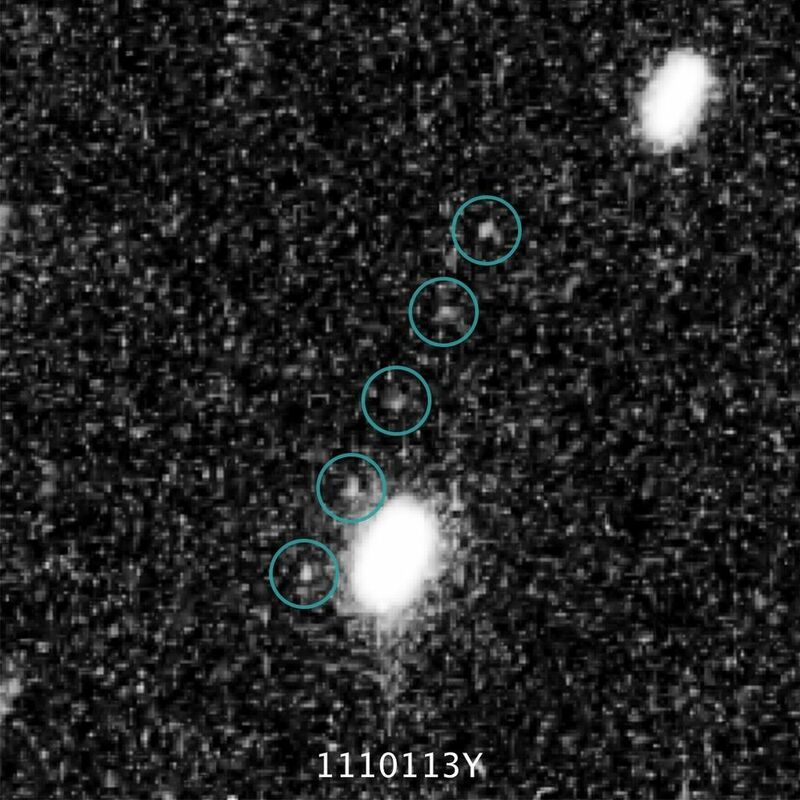 2014 MU69, also known as Potential Target 1 (PT1), was first spotted by the Hubble Space Telescope in 2014 and was chosen from a group of candidates as being the best target since it will take less fuel to get there. Five initial possible targets were narrowed down to two, and then finally to one. While much smaller than Pluto, about 1 percent the size and one-ten-thousandth the mass, it is thought to be 10 times larger and 1,000 times more massive than an average comet. The mission team hopes to get closer than the distance that the spacecraft came to during the flyby of Pluto. 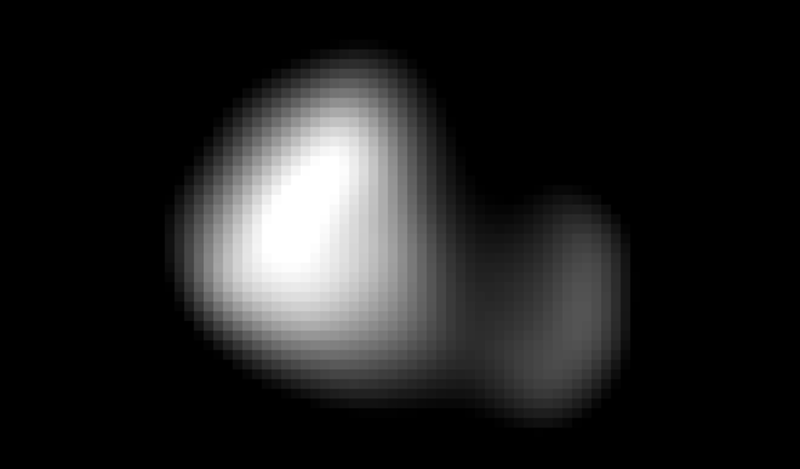 2014 MU69 represents the kind of rocky objects left over from the early formation of the Solar System. They are similar to main belt asteroids but are colder and better preserved, remaining virtually unchanged over billions of years. This provides scientists with a unique opportunity to study such ancient, primordial relics of our Solar System’s birth. It was recommended by the 2003 National Academy of Sciences’ Planetary Decadal Survey (“New Frontiers in the Solar System”) that this first mission to the Kuiper Belt should include flybys of both Pluto and other KBOs in order to maximize the science return. New Horizons is scheduled to arrive at 2014 MU69 on Jan. 1, 2019. If successful, the rocky object will then be the furthest world ever seen up close in our Solar System. 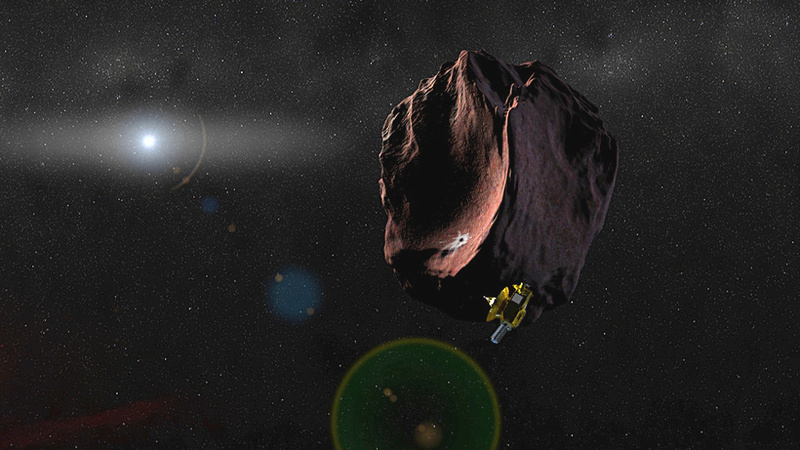 From the beginning, New Horizons was designed to be able to explore additional objects in the Kuiper Belt, carrying extra hydrazine fuel for that mission. 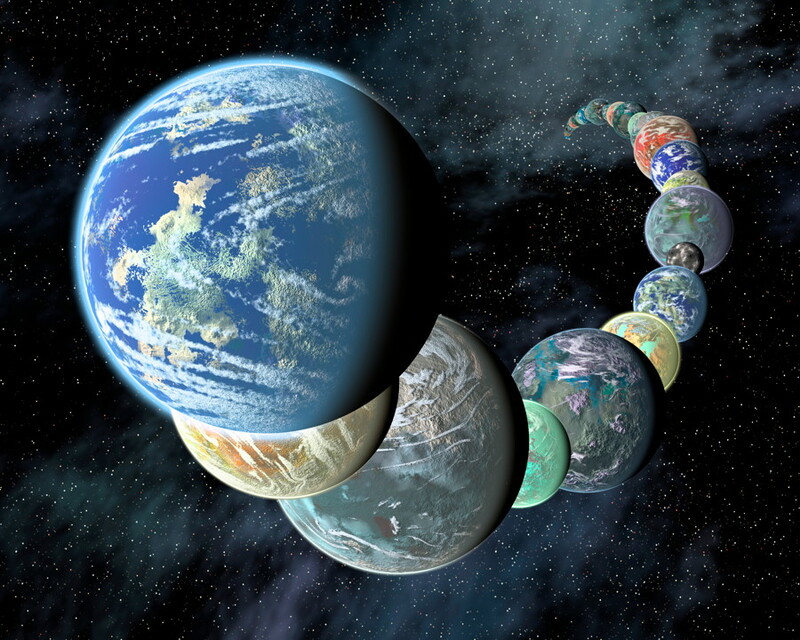 Its power and communications systems can also continue to work far beyond Pluto. The Kuiper Belt was named after Gerard Kuiper, who first theorized its existence. Over 1,000 KBOs have been identified so far, including Pluto, but many more are also expected to be discovered. New Horizons has sent back an incredible amount of data from the Pluto system, including stunning images and science discoveries which will revolutionize our understanding of this small world. As reported previously, the first science results have now been published in the journal Science and were the cover story for the Oct. 16, 2015 issue. The first images of Pluto’s tiny moon Kerberos were also just released, completing the “family portrait” of Pluto’s five known moons. Kerberos appears to be smaller and more reflective than scientists had expected. “Once again, the Pluto system has surprised us,” said New Horizons Project Scientist Hal Weaver, of the Johns Hopkins University Applied Physics Laboratory in Laurel, Md. “Our predictions were nearly spot-on for the other small moons, but not for Kerberos,” added New Horizons co-investigator Mark Showalter, of the SETI Institute in Mountain View, Calif. The moon has a double-lobed shape, with the larger lobe approximately 8 kilometres (5 miles) across and the smaller lobe approximately 5 kilometres (3 miles) across. 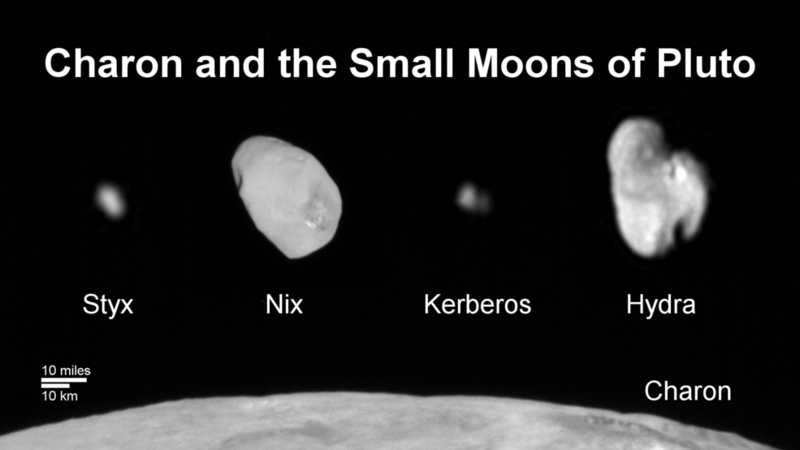 The reflectivity suggests that Kerberos is coated with water ice, similar to the other small Plutonian moons. The first 3-D images of Pluto’s surface have also now been released; the images now make global stereo mapping of Pluto’s surface possible, and require red/blue stereo glasses to view. Once thought to be a relatively inactive world, being so bitterly cold and far from the Sun, Pluto has been shown to be more geologically active than anticipated, with mountains of solid water ice, canyons, unusual pits, and large, slowly moving glaciers of nitrogen, methane, and carbon monoxide ices. The thin nitrogen atmosphere also glows blue when seen backlit by the Sun, not too different from what we see on Earth. New Horizons is currently 5 billion kilometres (3.1 billion miles) from Earth. Data from the flyby will continue to be sent back to Earth for about another year.